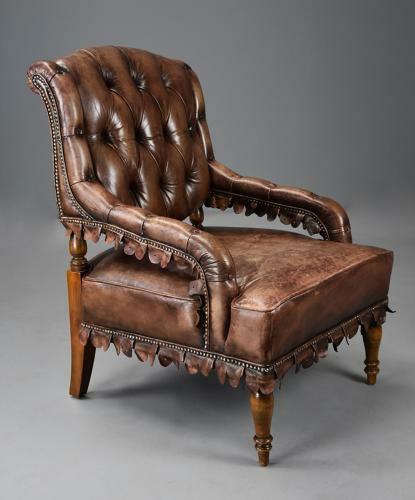 This chair consists of a shaped deep buttoned back with turned beech supports with deep buttoned leather arms with brass dome head nail decoration and pierced leather frill design. The deep padded seat with piping to the edge with brass dome head nail decoration to the lower edge with pierced leather frill decoration. The chair is supported on turned beech legs to the front with outswept legs to the back. This chair is in very good condition for age, is of stable construction and can go straight into a home.